Early in the 21st century, the world's domestic cat population is estimated to exceed 500 million. 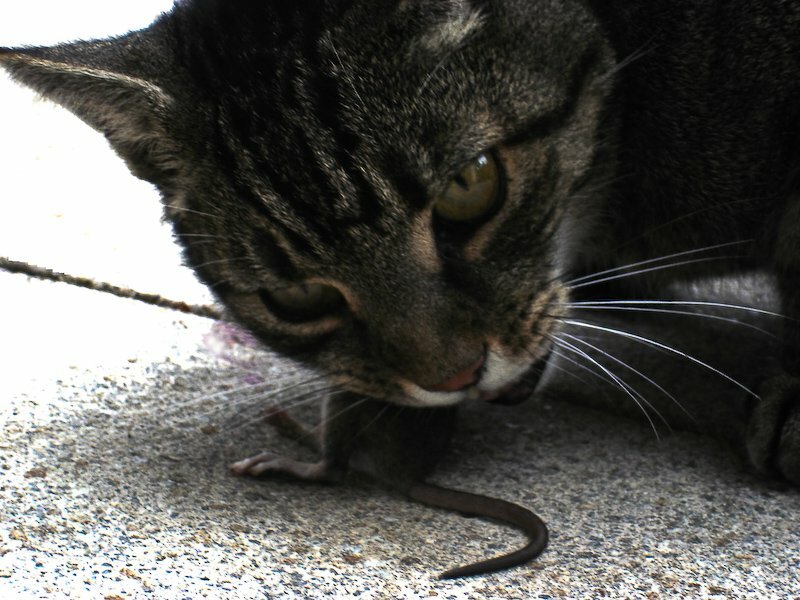 Cats kill untold billions of birds, mice and other small rodents each year. Many of these deaths are not quick and "clean". Cats enjoy "playing" with their terrified victims. Lacking a theory of mind, members of the cat family do not understand the suffering they are causing. Some vegans try to keep vegan cats; but in practice such dietary modification is almost impossible. Cats are not just natural predators but obligate carnivores. This gruesome massacre might seem inescapable short of technological advances hundreds or thousands of year away: genetic engineering, behavioural modification technologies via neurochips, and the radical alteration of feline physiology and metabolic pathways on a planetary scale. In practice, the gravest obstacles to overcome are ethical and ideological - and perhaps sheer status quo bias. Most people, and certainly most cat owners, do not acknowledge that the suffering caused by their pets is an ethical problem. If they did, then a technological fix would be feasible in a decade or so - admittedly only a stopgap for revolutionary changes to come. Thus consider, for example, catnip-laced cultured meat. Whereas cultured gourmet steaks for humans are several decades away, mincemeat-quality in vitro meat can already be produced, albeit in the laboratory rather than for commercial sale. The mass-production of cultured mincemeat for domestic pets is potentially scalable without limit. Moreover, ardent catlovers need not fear their pets will suffer from consuming an gastronomically inferior product. If laced with catnip, cultured meat could become a feline delicacy more exquisitely tasty than any "natural" alternative. No catnip-sensitive cat would want to eat anything else. To cater for the third of so of cats who are not catnip-responsive, different intoxicants could be added to cultured mincemeat as a no less benignly addictive alternative to catnip. More research is needed into the optimal ingredients. Of course, if and when humans get serious about abolishing non-human suffering, there are a host of practical pitfalls to be navigated. Not least, immunotherapy for rodent populations ("vermin") would be vital where cats currently exert a measure of population control. But the point to stress is that if we want to abolish the terrible suffering caused to other sentient beings by cats, then the task is an engineering challenge, not some kind of affront to God or Mother Nature. A cruelty-free world is technically feasible.